1. The 'new' 1:72 Hobbycraft Apache #2204 looks like a very poor copy of the Hasegawa kit, possibly originating from a Chinese source such as Zhengdefu. This should be avoided. "the detailed radial engine that sits in the nose appears to be a model in itself. Look out...!" 3. 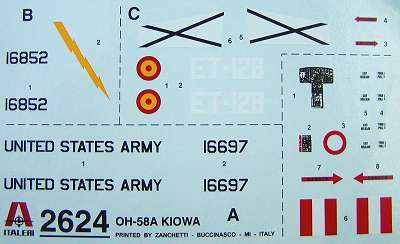 Italeri's new 1:48 OH-58A Kiowa is confirmed as a re-issue of the Esci moulds (unlike their 1:48 UH-1D). The Kiowa parts include three different types of skid assembly: one I think is designed to go with floats, (but you don't get the floats themselves) - this is not used; normal low skids for the US Army versions, and a high skid for the Spanish version, plus ground handling wheels. The photo of a built-up US Army model on the side of the box shows it with high skids, in contradiction with the instructions. The rear of the cabin can be fitted with either seating or with an ammunition box, in which case there is a 6-barrel machine gun to be fitted to the outside of the sliding cabin door on the port side. 4. The release of the Fonderie Miniature 1:48 H-21 has been delayed until the end of this year, or more likely the early part of 2003. OK, it's not really new. This is of course the decal sheet from kit BK-2, packaged together with the resin figure of pilot Mike Forney, from the film "The Bridges at Toko-Ri". Both these items are included in Belcher Bits kit #BK-2. For several years, the Belcher Bits kit of the HO3S was the only game in town in 1:48. It is accurate, allows several versions and includes a great decal sheet. However, some folks prefer injection kits over resin and Fonderie Miniature released their kit of the HO3S this year. Belcher Bits doesn't hold any grudges! For those who have purchased the FM kit, and would like to have a decent set of decals and a resin pilot, #BD-12 is the set for you. 7. 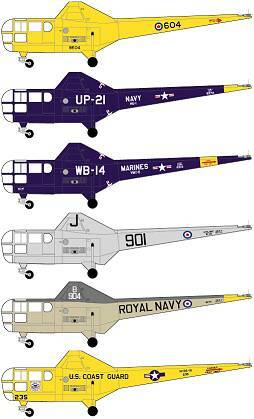 The proprietor of Aztec Decals would like to remind us that Aztec have a website where you can see a good selection of sheets with decals for mostly South American helicopters. These are available for order online, as well as being obtainable from a selection of distributors in Europe and North America. 8. The October 2002 issue of Scale Aircraft Modelling has a Lynx on the front cover and a 23 page feature on the Lynx inside. Included are colour profiles and marking details for 35 different Sea Lynxes, artwork by Jonathan Mock. 9. The August 2002 issue of Replic includes an article describing the building and super-detailing of the 1:72 Italeri/Revell H-19 into a camouflaged ALAT H-19 serving with GH2 in Algeria. The well illustrated 3-page article is supplemented by a further five pages of colour photographs covering French H-19's both in museums and in service. The author of this article, Christian Bouschon, has posted a few pictures of his completed model in the Heli-Kit News Gallery. This magazine is thoroughly recommended, whether you can read French or not. Thanks also to Tony Morgan, Andrй Genries, Sean T., and Aldo Flores (Aztec).